Conditional formatting quickly highlights important information in a chart. 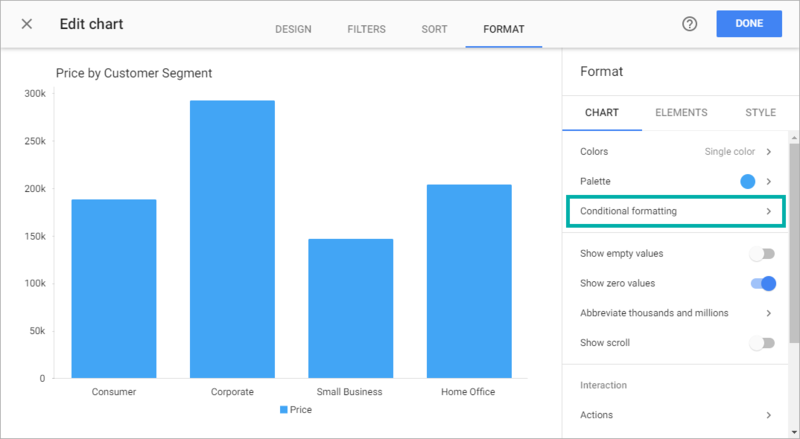 From the Format > Chart menu, select Conditional formatting. Click ADD A RULE. Select a rule from a menu, enter the value and choose the formatting style. Click APPLY. NOTE: conditional formatting enables you to create a rule for number-type values only. You can use more than one rule for each chart. To set the order, drag and drop the rule in the list. Note that the last rule in the list has a higher priority than the first one. Click the rule to edit it.